Invisalign® practically is a household name for those who want orthodontic treatment, and prefer to avoid wearing traditional metal braces to improve their smiles. We offer treatment with Invisalign, Invisalign Teen® and Invisalign Express®. This aesthetic system brings your teeth into alignment while remaining virtually invisible. Invisalign® treatment uses a series of clear, customized and removable aligners that are designed to straighten teeth and improve your bite. As one of the few Invisalign® Premier level providers in our community, we are certain that you are in the best hands for your orthodontic treatment. 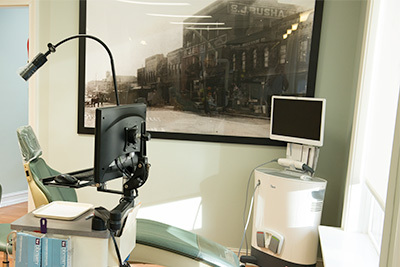 Our orthodontists use an iTero scanning machine to get a 3-D scan of your teeth, then we decide on a treatment plan and send the impressions off to Align Technology to create your custom series of aligners. The aligners are made of BPA-free plastic that are smooth. Each of the aligners should be worn for approximately two weeks before switching to the next in the series. You should wear aligners every day and only remove them when eating, or brushing and flossing your teeth.